Let's discuss the few drawing supplies you need to become a good artist. It is a mistake to buy too many materials to begin with. If you have too much to choose from, you won't know where to start and you might give up. It is far better to have just a few things on hand to prevent you from jumping from one thing to another. Just choose a few necessary items and learn to use them well. One of the best things about this hobby is that it is inexpensive. Expensive materials will likely spoil your instinct for experiment because you will be too afraid of wasting them. So let's stop and consider what it is we really need to get the satisfaction that artists talk about. As a beginner artist, it's fine to use any type of pencil that you have available. As you become more encouraged with your progress, you will search for pencils that give the best results in drawing. A set of 12 pencils will be sufficient but make sure the set includes "B" pencils. Once you start playing with these, your artwork will begin to take on a new look. The range of pencils available is wide and varied. I was given a 12 piece Derwent Graphic Pencil Set which was perfect because it allowed me to experiment with a good range of pencil grades. I still use these pencils all the time! For all learners, the best pencil is a 2B (that's the grade). This is a soft pencil, it can produce soft grays and strong blacks. If you like doing small sketches, mechanical pencils with a fine point are a wise choice. Mechanical pencil leads come in a range of sizes with different grades. I like .5mm (size) with 2B (grade), but you can experiment to discover which one suits you the best. Mechanical pencils aren't suitable for larger drawings. It would be time consuming and difficult to do a large illustration with such a fine lead, you are better off using a wooden pencil with a thick lead. Once you become more experienced, you will be able to determine which grade and brand of pencil to use. For example, choose a soft grade (B) to incorporate shading or use more than one grade pencil to achieve a variety of effects. Everyone has different requirements. Drawing pencils should be free of any scratchy particles or grit so they can glide over your paper easily. This article in Wikipedia explains more about pencils. Once you become more experienced, your drawing supplies won't be complete without the paper of your choice. Lucky for us, there's a huge variety of paper and sketch books available at very reasonable prices. Beginner artists can use photocopy paper because it sustains continuous erasing without damaging the surface. It's a good thing that photocopy paper is not expensive. I bought 5 different types of small sketch pads so I could experiment with them to find the best one that suits my particular style. You decide which paper you like to include with your drawing supplies, simply by practicing and experimenting. Here's a book that finally dispels the mystery of sketching! Learn clever tricks that help you achieve good drawings. At the start, you will be satisfied with just one ordinary eraser. It needs to be good quality because a bad eraser can ruin your drawings. It is to your advantage to own a soft and smooth white plastic eraser. With this particular type of eraser, you are also able to cut it, to get at finer parts of your artwork. Ink-erasers should never be included in your drawing supplies, they destroy the surface of the paper. As you become more adventurous, you will probably want a kneadable eraser. They are very clean to use because they don't leave any residue on your paper. This eraser can be moulded into a point to access small areas. I love mine and I use it all the time, they are magic and very cheap. You only need to dab at the spot and the graphite will stick to the kneadable eraser. Once the surface of the eraser gets dirty, just fold it over to access a clean spot. You can use erasers to obtain different effects in your drawings, too, but that's a whole other story! As you progress, you might want to include blending stumps in your drawing supplies. A blending stump is a tightly wound stick of pressed paper that is used to blend or smudge graphite. It helps to produce gradations and different tones in your images. A tortillon is similar -- it's a stump that is twisted to a point. There is confusion about whether it is tortillon or tortillion but according to the dictionary, it is spelt with just 'on' on the end. If you don't have one of these, you could improvise and wrap a tissue around a pen tip and tape the tissue to the pen to hold it in place. You can also use a tissue or paper towel around your finger tip. Try not to use your fingers for blending because skin contains oil and it can ruin your drawing with the passing of time. I bought a set of blending stumps which gives me a better variety to use when the mood suits. The last item you need in your drawing supplies is a good sharpener that has sharp, straight blades so that the point of your pencil doesn't break. Inexpensive sharpeners waste a good pencil. 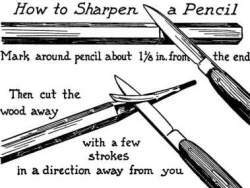 Another alternative is to cut your pencil with a craft knife. 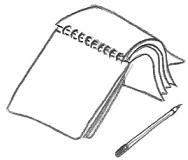 Try not to make a sharp point, it will dig into your paper, and that will add to your difficulties when erasing. A thin point isn't any good because it snaps easily and needs constant sharpening. You can also use fine sandpaper to hone the point of your pencil. If you don't have any sandpaper, try using an emery board. Some drawing kits or sets are an inexpensive way of owning a good variety of all the essentials I have spoken about on this page. Just as we choose what drawing methods we like, the same applies to choosing our art supplies. It's good fun to search for Amazon art deals and find great specials whenever you are in the mood to shop. Once you try different effects and techniques with your pencils and paper, you'll soon develop a partiality for certain brands to use. You need to experiment and become the Master of the drawing supplies that suit you the best. * Allaboutdrawings.com is a participant in the Amazon Services LLC Associates Program, an affiliate advertising program designed to provide a means for sites to earn advertising fees by advertising and linking to Amazon.com. Copyright © 2005 - 2019 www.allaboutdrawings.com. All rights reserved.